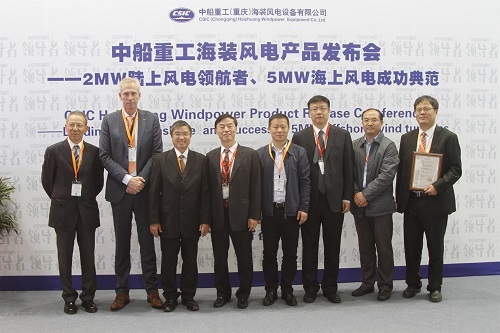 LM Wind Power CEO Marc de Jong at the CSIC HZ Windpower type certificate event at China Windpower. LM Wind Power announces strategic collaboration with Chinese wind turbine manufacturer CSIC (China Shipbuilding Industry Corporation) HZ Windpower to deliver blades for its newly launched H151-5.0MW platform. The blades will be delivered from LM Wind Power's plant in Jiangyin. The first sets are expected to be installed in Q4 2016 at Rudong wind farm. "It is a great pleasure to support CSIC HZ Windpower, a pioneer and leading player in the development of the offshore wind market in China, and launch their new offshore wind turbine platform. This deal strengthens LM Wind Power's growth in China and emphasizes the importance of highly reliable and efficient blades as a key factor for expanding the growing offshore sector." "Taking advantage of LM Wind Power's advanced technology, highly reliable manufacturing and long track record in successful offshore blade supply, CSIC HZ Windpower aims to play a leading role in the development of offshore wind in China. We chose LM Wind Power blades because reliability and quality really matter in the offshore sector," Zhang Haiya, Deputy Director of R&D Center, CSIC HZ Windpower commented. Already in 2013, two prototype turbines with the LM Wind Power blades were installed in Rudong in the Jiangsu Province. The successful operation and excellent performance from the prototypes paved the way for the long term deal now announced between LM Wind Power and CSIC HZ Windpower. China is set to invest significantly in offshore wind over the coming years. The 13th five-year plan issued by China's central government has a target of more than 5GW offshore installation by 2020. With today's offshore installations amounting to approximately 1GW, meeting this target requires strong growth and mobilization of key players over the next five years. LM Wind Power is a leading independent designer and manufacturer of rotor blades for wind turbines, with a global manufacturing footprint that includes blade plants in Brazil, Canada, China, Denmark, India, Poland, Spain and the United States. LM Wind Power was the first overseas blade supplier to start operations in China when it established a blade manufacturing plant in Tianjin in 2001. The company currently employs around 2,200 people in China. Since 1978, LM Wind Power has produced more than 185,000 blades, corresponding to more than 77 GW installed capacity and global savings of more than 147 million tons of CO2 annually. Founded in January 2004 as a subsidiary of the CSIC group, CSIC HZ Windpower has a total installation record of 6GW. Ranking in the top 10 in the global wind industry, CSIC HZ Windpower is the only high-tech company who owns the full supply chain under the same group. With its "One center, three businesses" strategy (National Offshore Engineering and Technology Center, Wind Power Equipment Manufacturing, Wind Power Engineering Service, Wind Farm Investment & Development), CSIC HZ Windpower will proactively develop onshore, offshore, overseas market and the service business.